These figures, it should be noted, represent the flow of CO2, from one source, into the atmosphere. However we are dealing with a system of flows, from other sources such as changes in land use and into carbon sinks in land (chiefly biomass) and sea: the interactions between these flows, over time, determines the stock of GHGs in the atmosphere (see this article for a longer discussion). 2) Since energy-related emissions have not increased for the last two years, then other emission sources must be increasing at a greater rate. There are several components to this. Firstly emissions from human activity other than fuel combustion – e.g. cement manufacture (other than fuel use) and waste disposal. Secondly, release of GHG’s from sources such as forest fires, permafrost thawing, soil degradation, and ocean stores (this includes the indirect results of human activity). (For a full dataset, see here). Thirdly, there has been an exacerbation by this year’s El Niño event (but we have to ask why El Niño is so strong this time).. 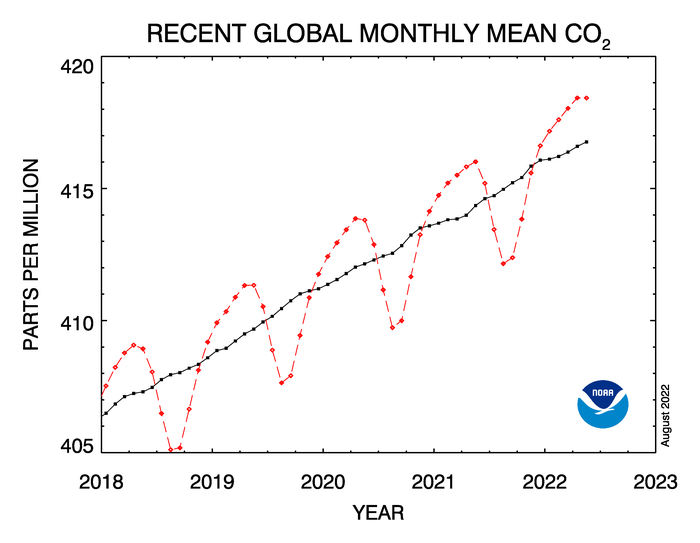 In the first graph, however, the GDP line is steeper than the emissions line, possibly indicating the well-known phenomenon of relative decoupling. We However, as discussed previously, CO2 levels are still growing with GDP even though the economy gets more efficient in its energy use. But as Jevons demonstrated in the nineteenth century, that reduction of energy intensity of economic activity leads to greater overall economic output, thus compounding the problem: the more that is saved, the more growth there is and therefore the more emissions. Mark H Burton is part of the Steady State Manchester collective, which promotes the ideas of post-growth, steady state, ecological economics, applying them to the very challenging reality of the world's first industrial city, Manchester, and its region. He has a background in ecological activism and international solidarity campaigns, psychology and public service management and is also Visiting Professor at Manchester Metropolitan University.